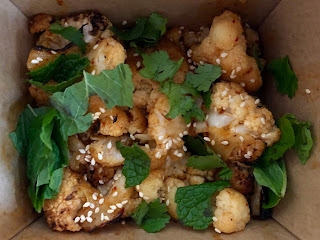 I missed out on most of the action during the Great Sacramento Vegan Burger Battle in June because of out-of-town guests and travel. 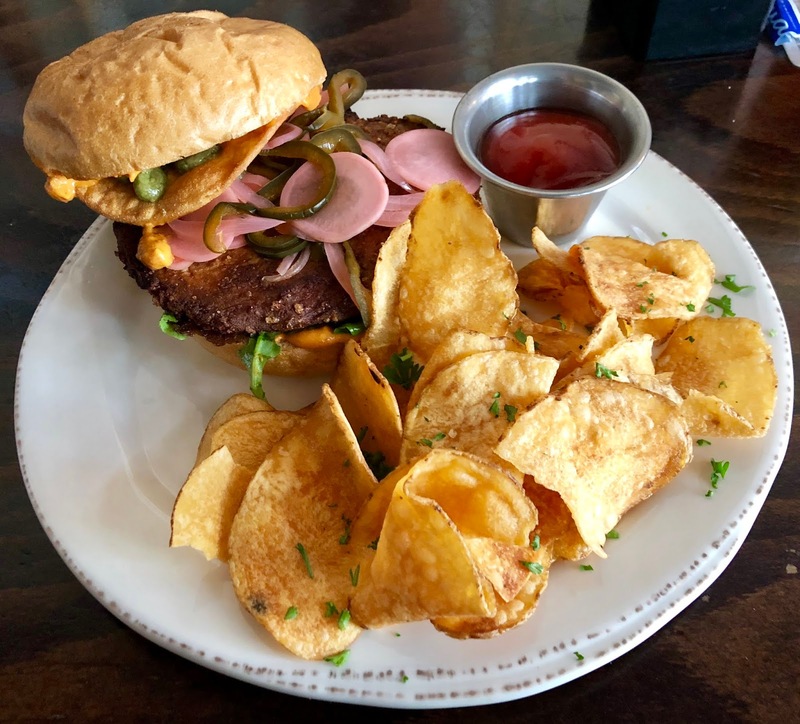 One burger I was very sorry to have missed was the Beyond Burger that de Vere’s Irish Pub was dishing up. It received rave reviews from many people I follow on social media. 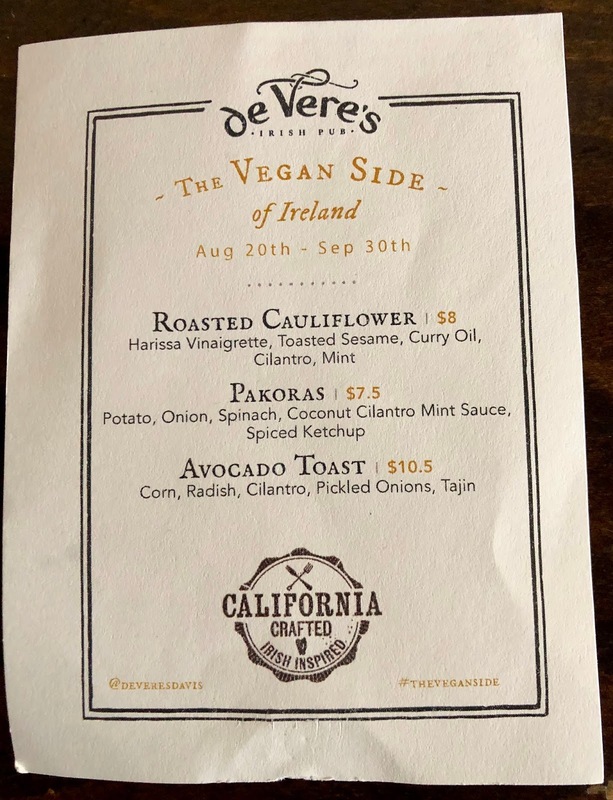 I’m happy to report that de Vere’s still has a Beyond Burger on their menu, although I don’t think it’s the same as the one they offered in June. Nevertheless, my husband Phil and I stopped in for lunch today at de Vere’s so I could try it. This particular Beyond Burger patty is served on a ciabatta bun and topped with a smoky chickpea spread, arugula, toasted cumin vinaigrette, avocado mousse, pickled vegetables, and tortillas, and it was outstanding. Of all the Beyond Burgers I’ve tried, this one was my favorite. The Beyond Burger isn’t de Vere’s only vegan option. 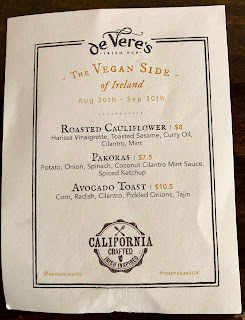 On the table, there was a small menu called “The Vegan Side of Ireland,” listing roasted cauliflower, pakoras, and avocado toast. These items will be available through September 30th. I knew I’d be too full to have any of those dishes along with my burger, but since I love cauliflower, I ordered the roasted cauliflower to go. It was great! de Vere’s Irish Pub is located at 1521 L Street, and their phone number is 916-231-9947. Their website address is https://www.deverespub.com/, and their Facebook page can be found at https://www.facebook.com/deverespub/. The restaurant is open Sunday from 10:00 a.m. to midnight, Monday and Tuesday from 11:00 a.m. to midnight, Wednesday through Friday from 11:00 a.m. to 2:00 a.m., and Saturday from 10:00 a.m. to 2:00 a.m.